Jaguar has taken a bullish approach to announcing the newly revised, 2016-model-year XJ. The car that overturned the British marque’s fusty old-boy image is at it again, not so much with its updated looks – which appear elegantly judged at first glance, considering the radical nature of the existing version – but thanks to the far-reaching technology changes under the skin. New InControl Touch Pro infotainment includes door-to-door navigation via the InControl Apps’ smartphone integration system; the reconfigurable 12.3-inch TFT instrument cluster now has a full-screen navigation mode; traction-enhancing All-Surface Progress Control aims to prove more useful than rivals’ four-wheel drive in snow and ice; and Jaguar has ditched hydraulic power steering in favour of a new electrically assisted set-up that it says offers 'greater feel'. Meanwhile the 3.0-litre V6 turbodiesel now generates 296bhp and 516lb ft, while producing 6% lower emissions. And as if in an effort to benefit from a clearer public synergy between Jaguar and Land Rover, the XJ also gains a new top-spec Autobiography trim level. Autobiography has previously been the reserve of posh Range Rovers. Better feel from electric steering, 4wd-beating traction from RWD... have they lost the plot? These are certainly bold claims - you've got to admire Jag's chutzpah. Take the steering, for example. The conventional view suggests the sacrifice of hydraulic assistance on the altar of efficiency has been a Very Bad Thing for driving involvement, yet here’s Jaguar saying the XJ’s new electrically assisted system offers improved feedback. No doubt the chauffeurs’ union will hoist a glass in Jag’s honour at the next luncheon. Seriously, though, it’s a bold claim – the sense of which will have to wait until we’ve experienced it. But Jaguar is adamant: ‘hydraulic systems have nothing more to give and have reached the limit of their potential,’ they claim. Electric systems are also essential for enabling advanced driver assistance tech, although at present the XJ only makes use of this to semi-self-park. The full power of these systems lies around the corner, as we tiptoe towards greater autonomous driving. Still, 0-62mph in 6.2sec will give even the latest crop of hot hatches pause at the traffic lights, while efficiency improvements see CO2 fall to 149g/km and economy increase to 49.6mpg. The 3.0-litre supercharged V6 and 5.0-litre supercharged V8 petrol alternatives produce 335bhp and 503bhp, respectively. That's the supercharged XJR hot-rod pictured above. 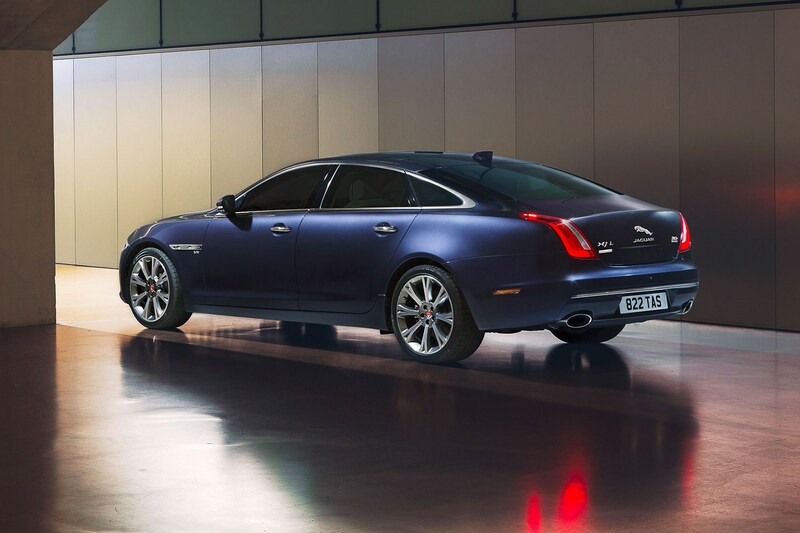 What about the other upgrades for the 2016 Jaguar XJ? Visually, the main identifier for the 2016 XJ will be the new ‘twin J-Blade’ daytime running lights, part of a new all-LED headlight design. There are fresh LED rear lamps, too, plus a larger, more upright grille and some revised chrome accoutrements. Above this is the new Autobiography specification, which is only available on the long-wheelbase XJ. This features chrome vents and 20in rims on the outside; semi-aniline leather seats, leather headliner, oak veneer and ‘illuminated stainless steel treadplates, air vents and boot finisher’ on the inside. In the rear you’ll find adjustable individual seats with massaging function and folding 10.2-inch HD screens. As per XE and XF, an R-Sport spec also joins the XJ range, complete with sporty bodykit, seats and interior trimmings. The new InControl Touch Pro infotainment system is designed to be operated like a smartphone, so you can change the wallpaper, add and remove widgets, and pinch to zoom – familiarity aimed at reducing distraction. Based around a 60GB solid-state drive, it should be quick to respond, too. Especially the sat-nav, which also uses dead-reckoning to improve accuracy in areas where GPS signal is limited, such as cities. The nav can also interact with a special app on your phone to offer guidance on public transport and foot access, should they – heaven forbid – be necessary for the completion of your journey. Meanwhile ‘Commute Mode’ learns your daily route and automatically offers guidance on avoiding traffic disruptions. Jaguar offers two levels of remote access app for the XJ. ‘Remote Essentials’ allows you to check fuel level, that the doors are locked and that the windows are closed. ‘Remote Premium’ allows you to lock or unlock the doors, receive alerts if the alarm goes off, locate the car on a map and set the climate control by remotely starting the engine. Hours of fun in the company car park. Volkswagen has been working on similar systems. It almost goes without saying that a wi-fi hotspot is offered – as is vehicle tracking in case of theft, and automatic emergency services notification including GPS location should the airbags go off. Ditto the traffic sign recognition, the Adaptive Cruise Control with Queue Assist and the optional digital TV tuner. Radar sensors offer long-range hazard detection front and rear. When is the new Jaguar XJ on sale and what does it cost? The new 2016 Jaguar XJ goes on sale this autumn, likely around the time of the Frankfurt motor show in September 2015. Prices start at £58,690 for the short-wheelbase 3.0D Luxury, rising to £100,000 flat for the long-wheelbase 5.0P S/C Autobiography. Yep, a £100k Jag saloon. Here’s hoping it doesn’t turn into the car that says ‘I can’t quite afford a Bentley’.